Greetings from the remote coast of Maine, where the hunting season has just begun, which means we’ll all soon be walking around with blaze orange hats and jackets, trying not to look like deer, and adding one last blast of color to the neighborhood before things become grey and the cold really settles in, sending us all indoors for the next five months. You might be startled to hear from me. After all, it’s been six YEARS since I last mailed out a newsletter, and I can understand if right now you’re saying to yourself, “Gee, I didn’t know this guy was still alive,” or worse, “Who is this guy, anyway?” I’m happy to report that I’m alive and well, and still making lots of music, and I want to share it with you. I won’t presume to give you a detailed musical history of my last 6 years, but here’s the summary: I am still the pianist for the Paul Winter Consort, based in New York City. 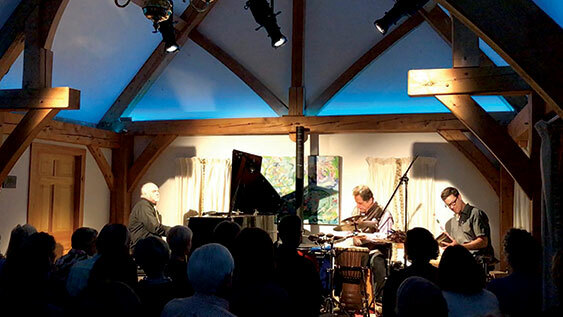 I have played with this group of amazing musicians for almost 30 years now, and it has been a magic carpet ride indeed.We have travelled the world over, including lengthy rides on the Trans-Siberian Railway, concerts in the Sinai Desert, and many performances at the Cathedral of St. John The Divine in NYC, the world’s largest Gothic cathedral, where we have been Artists-In-Residence for decades. On my own, I’ve played many concerts, both solos and with some of my favorite musician friends. I’ve composed soundtracks for films, scores for dance companies, improvisations with poets, and provided music for all the great stages of life, from births through memorials and everything in between. Music is a profound vocation, and I am grateful for it every day of my life. I’ve travelled a whole lot over the years, but since I’ve hit the age of 60, I find the more appealing gigs are the ones where I can sleep in my own bed afterwards. I’m sure some of you can relate! As a result, I’m still making music full time, but more often in Maine and New England than in Spain and New Zealand, (though I’m happy to make occasional exceptions). So I invite you to come to a concert the next time you’re up this way. Your best chance of hearing me live is to come to a concert at my house–seriously! I’ll tell you more about that in a moment. My “Magnum Opus” over the the last few years has been writing the music and lyrics for a full-length musical called “The Last Ferryman”. It was commissioned by a local opera house on an island just off the coast from where I live. They produced it to commemorate the 75th anniversary of the completion of the Deer Isle Bridge, which in 1939 connected the island to the mainland for the first time. “What a ridiculous premise for a musical”, I can just hear you saying to yourself. But you’d be wrong! Admittedly, the building of the bridge was a small, very local event. It is certainly true that most of the world was, and will forever remain, completely unaware of it. But on the other hand, the subplots that arise, when you look into the history of it, are compelling and dramatic and complex. On the surface, it is the story of a bridge being created, but just below the surface is the universal predicament of a community reacting to massive and permanent change.You realize ultimately that it is a story that most of us have shared in our own lives in one way or another. The show ran for a month in 2014, and was wildly successful, breaking box office records for the little Stonington Opera House. No one gave any thought to future productions. As in most busy theaters, the minute the curtain came down at the end of the last performance, they were well underway with the next production. We creators all went our separate ways and that was apparently that. Except that it wasn’t. People didn’t forget about it even six months later–even a year later, and now even three years later. Many people have asked me over the years when they were going to have a chance to hear the songs again, and I never had an answer for them, until now. This last winter I spent a few weeks in Los Angeles, recording “The Songs OfThe Last Ferryman.” We recorded it in LA because I am lucky enough to have an old friend, Brad Dechter, who just happens to be one of the pre-eminent musicians on the Hollywood scene these days. Brad produced the recording and hired the very best singers to participate. It was absolutely stunning to hear the music explode into life with such vibrancy. It was one of the most exciting moments of my career! And now I am eager to share it with you. 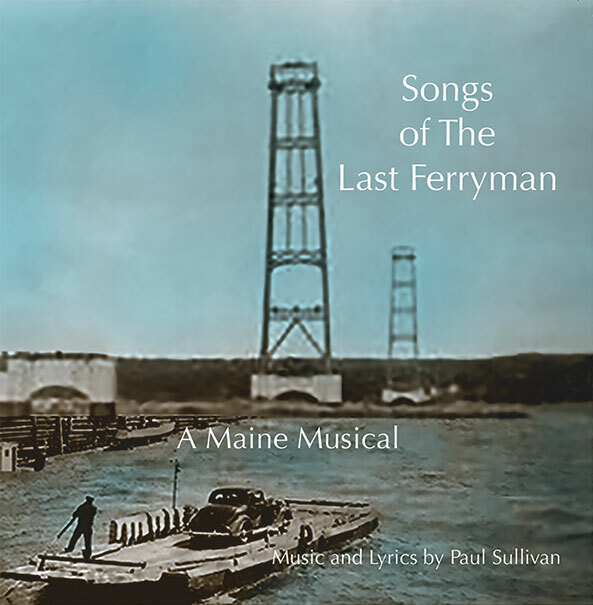 Most of you have never heard any of my theater music, and I think you will be happily surprised.“The Songs of the Last Ferryman” encompasses a WIDE range of styles, from Gilbert and Sullivan to contemporary pop ballads by way of some operatic Richard Strauss, but all with the Paul Sullivan “accent,” that runs through all of my music. The songs themselves clearly lay out the characters and story line, so you’ll have no problem comprehending it all. “The Songs Of The Last Ferryman” CD is now available. You can listen to some samples on my website, Rivermusic.com, and you can purchase it there as well. You can also send in the paper order form that is part of this newsletter. However you get it, I think you’ll be glad you did. Oh, and did I mention that Christmas is right around the corner? A copy of “The Songs Of The Last Ferryman” CD would certainly be a unique and welcome stocking-stuffer. Just sayin’. A little earlier I invited you to come to our house here in Maine for a concert, and I meant it. Jill and I moved into a new home three years ago, and one of the reasons was because the new place has its own concert hall! Perhaps the word “hall” is overstating it just a little bit; we’re not talking Carnegie North here, but it is truly a lovely place to listen to fine music. The Palazzo; great music, up-close and personal. In fact it’s better than Carnegie Hall in some ways. There is only seating for about 45 people, which makes it a truly intimate listening experience. You can hear absolutely everything and be close to the musicians as they create. And having played in Carnegie Hall myself, I can guarantee you that, like Carnegie Hall, the music you’ll hear is of the very highest quality. It’s an elegant room, with a stage, theater lighting, and a brand-new very high-tech piano which I just love. And, unlike Carnegie Hall, no traffic or parking problems at the Palazzo. Just drive up and come inside! And after the concert, we always either have a reception with drinks and snacks, or else a full-on potluck supper. Everyone hangs out and has a fine old time. Try doing THAT at Carnegie Hall! I call our house the “Palazzo” because it was built by a wealthy Italian man and has a distinctive Euro flair to it. I can’t believe we live in it, but that’s a whole other story, which I can tell you at one of the potlucks if you come. Palazzo concerts take place about once a month, sometimes more frequently, sometimes less, depending on which musicians are around. After many decades as a musician, I have a lot of unbelievably talented friends from all over the world. Whenever they get within striking distance of Maine, we play a concert together. The energy in the room, onstage and off, is gloriously positive. I know that most of you live a long long way from Maine, and that the chances of your coming to a concert at our house are not particularly high. But you never know. If you would like to be on the email list for Palazzo concert announcements, we’d be very happy to let you know whenever they occur. If not, you can just check the website from time to time to find out what the next concert is. In any case, if you could ever make it up here to a “Music at the Palazzo” concert, you’d be enchanted. They’re really fun. I’ll say goodbye for now, but I wanted to let you know that this is the LAST printed newsletter that I’ll be sending out. Email has won. From now on, all my newsletters will be electronic, for all the obvious reasons. So that means that if you would ever like to hear from me again, (and needless to say, I hope you will! ), I will need your updated email address. So PLEASE go to the contact page and fill in the contact address form with your email. It would mean a lot to me. As ever, I thank you all for being my friends and supporters. You are the oxygen which keeps my music alive, and I am truly and deeply grateful. Please stay in touch!